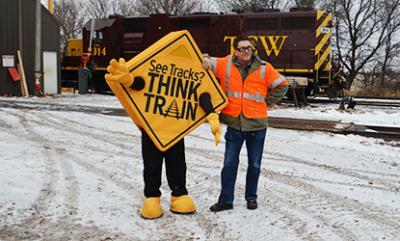 Twin Cities & Western Railroad, headquartered in Glencoe, fulfilled a dual purpose Friday afternoon — it was able to help KDWB radio personality Dave Ryan fulfill his “bucket list” dream of riding on a train, while at the same time promoting its “Operation Lifesaver” safety program. Above, Ryan is shown with the Operation Lifesaver mascot. Ryan got to ride in an engine to Bongards and back, which he promoted live on Facebook.